Samitivej Plusis an application that has been developed for patients of Samitivej Sukhumvit Hospital, Samitivej Srinakarin Hospital and Samitivej Children’s Hospital. The app allows to search for doctors, request for appointments and pay hospital bills, without the need to queue. Patients can also use the application to check their medical records, prescriptions, laboratory results and X-rays. The app even allows patients to view their queue position and service steps in real time. Q: What operating systems support Samitivej Plus app? A: Samitivej Plus can be used with iOS 10.0 or above and Android operating systems. Q: How can I get Samitivej Plus app? A: You can download the app from App Store and Google Play. Simply install it on your smartphone or tablet and then register for the service. Q: Can Samitivej Plus app be used at all hospitals of the Samitivej group? 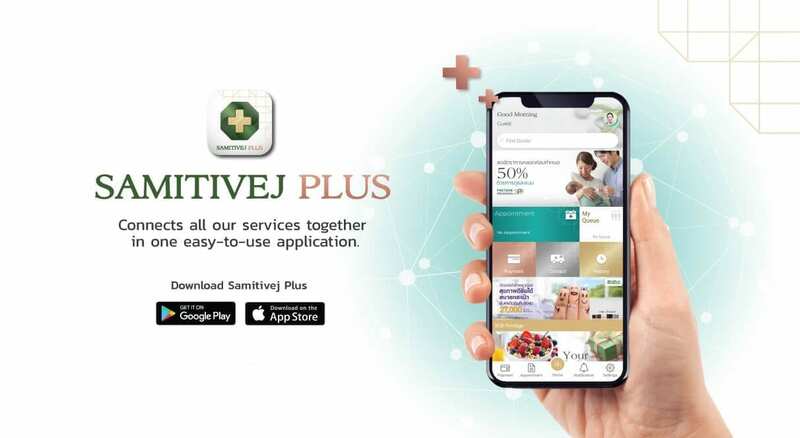 A: Currently, Samitivej Plus app may only be used at Samitivej Sukhumvit Hospital, Samitivej Srinakarin Hospital and Samitivej Children’s Hospital. Q: How secure is Samitivej Plus app? A: Samitivej Hospital recognizes that the protection of personal medical information is number-one priority. The app operates at a world-class level to ensure information is stored as safe and secure as possible. When registering for the Samitivej Plus app, patients are required to confirm their first name, family name, telephone number, date of birth and national identity card number or passport number, before being asked to set up a secure password. Additionally, each time when accessing personal medical information, the user must enter a PIN code. While we are confident of the app’s security, customers must also recognize the importance of data protection and be prepared to enter a password, PIN code and personal information each time they open Samitivej Plus app on their mobile phone or tablet, in order to ensure utmost security is maintained. Q: Can Samitivej Plus be used when traveling abroad? A: Samitivej Plus app can be used all over the world. All that is required is a secure Internet connection for your phone or tablet. A: You can set up a new password by selecting the “forgotten your password” link on the home screen. Follow each step until you have completed the new password setup procedure. Q: Can I use Samitivej Plus if I haven’t registered? A: If the registration process has not been fully completed, users are restricted to only access some of the app’s functions. We highly recommend that you complete system registration to get the full range of benefits from Samitivej Plus. Q: Once registration is complete, how do I begin using the app? A: Each step of the registration process is important, as it will enable customers to view their entire personal medical information. Thus, if you have ever been a patient at Samitivej Sukhumvit Hospital, Samitivej Srinakarin Hospital and Samitivej Children’s Hospital, please enter the same information you have given to the hospital in the first instance. Alternatively, you may contact the hospital’s registration department. However, if you have never been a patient at aforementioned hospitals, the system can still link to your personal information once you have registered with the hospital’s registration department. Q: What should I do if I have registered, but still cannot use the service? A: If you have successfully completed registration, but are still unable to view your appointments, make payments or view your personal medical information, this may be because you have no medical history with Samitivej Hospitals. Alternately, you may have entered information during the registration process which does not match with the information you provided when you first registered at the hospital. In such cases, please contact the registration department in person to verify the information and begin using Samitivej Plus app. Q: What is the PIN code used for? A: The PIN code is used to confirm the identity of the patient when entering the “Payment” and “Personal Medical Information” sections of the app. Patients should keep their PIN code secret at all times. Q: What should I do if I forget my PIN code? A: You can set up a new PIN code by selecting menu “Settings” -> “Personal Information” -> “Change PIN” -> “Forgotten PIN Number”. The system will then send you a new PIN code via email. A: Your “personal information” cannot be altered. If you wish to make any alterations to your personal information, please contact the hospital’s registration department in person. Q: How can I change the language? A: Samitivej Plus is currently available in Thai and English. You can change the language by selecting “Settings”, then choose “Change settings” and select your desired language. Q: How can I change notification settings? A: You can turn notifications on and off by choosing “Settings” -> “Change Settings” and then swipe all tabs to “gray” if you wish to “turn off” notifications. Alternatively, swipe the tabs to “green” if you want to turn on notifications. Q: How do I cancel Samitivej Plus system? A: You may cancel your account by selecting “Settings” -> “Personal Information” -> “Cancel My Account”. Q: Can Samitivej Plus be used to book an appointment at any time? A: Samitivej Plus can be used to book appointments 48 hours (2 days) or more prior to the appointment. For example, if today was the July 1, 2018, the system will allow an appointment to be made for July 3, 2018, and thereafter. If you would like to make an appointment within less than 48 hours’ notice, please contact our staff at info@samitivej.co.th. Q: How will I know if my booking has been successful? A: Your appointment will be confirmed via email within 24 hours of the booking being made. Please check the email address that you used when registering. If you have not received a confirmation email, please contact our staff at info@samitivej.co.th. Once you have successfully made an appointment, the details will be shown on the app’s homepage and within the “Your Appointments” section. Q: How can I cancel an appointment through Samitivej Plus? A: Samitivej Plus cannot be used to cancel appointments. If you wish to cancel an appointment, please contact our staff at info@samitivej.co.th. Q: How up-to-date will my personal medical information and treatment history be? A: Samitivej Plus will only display medical treatment information carried out by doctors for a maximum of 10 days from the time of your latest visit to the hospital. Q: How are laboratory results displayed? A: Samitivej Plus can display up to 10 laboratory results for a period of up to two years back. Additionally, graphs are used to display lab results of the same category, once that three or more of the same tests have been done. These results are also shown for a period of up to two years. Q: How is information related to medication displayed? A: Samitivej Plus will only display medication that has been prescribed by your doctor(s). Q: When can Samitivej Plus application be used to make payments? A: Once outpatients have been treated by a doctor and have received a medical discharge, the system will calculate the total amount due and notify you through the app. You will see the outstanding amount in the “Payment” section of the menu. Q: How can I make payments with Samitivej Plus app? A: Select “Payment” from the menu and then select the payment that you wish to make. Check that the information is correct before entering your credit card details. The system will then send you a receipt for payment via email. A: Samitivej Plus supports payments made by Visa and MasterCard credit cards issued by any bank, worldwide. Q: How secure are the payment channels? A: Samitivej Plus payment system utilizes the highest, world-class standards of security available while also working exclusively with the most trustworthy banking institutions. The system uses Triple DES encryption and 256-bit SSL to ensure maximum security when sending and receiving information through the Internet, in order to protect against data theft. Users making payments are also protected by the use of a one-time password (OTP), as well as by the data protection feature that Samitivej Plus server does not save users’ credit card information. Q: How will I know if my payment has been successful? A: Once your payment is complete, the system will send a confirmation email. Additionally, in the payment section of the menu, your “Payment for Services” status will change from “Outstanding Charges” to “Paid”. Q: How can I receive a physical receipt once I’ve completed payment through Samitivej Plus app? A: If you require a physical receipt, please contact the hospital’s finance department and show the screen displaying the payment for which you require a physical receipt. Alternatively you may show the confirmation email you received for the payment. Q: How does Samitivej Plus display charges for services? A: Samitivej Plus displays charges that date back two days. For example, if you have received service on July 10, 2018, you will see charges incurred between July 8-10, 2018. Q: Can membership discounts and insurance policies be claimed through Samitivej Plus app? A: Samitivej Plus supports a self-pay system exclusive to outpatients. If you wish to claim insurance or utilize any membership discounts, you may contact our finance department for assistance with a claim or receiving a discount. Q: What evidence is required to confirm receipt of medication when paying through Samitivej Plus? A: You may receive your medication by showing staff your payment receipt which you received via email, or by showing the confirmed payment screen on the app. Q: Can you pay in installments or with part payments through Samitivej Plus? A: Samitivej Plus only accepts payment in full. Q: My queue number is not displayed when I come to Samitivej Hospital. A: Currently, the queue position service via Samitivej Plus is only available in the Internal Medicine Departments of Samitivej Sukhumvit Hospital and Samitivej Srinakarin Hospital. The service will be expanded to additional departments in the near future. Samitivej Plus Mobile Application: Use your mobile phone for fast and convenient payments by credit card. Just download Samitivej Plus application today, enter your details and begin using this new and fast channel to pay hospital bills, with the highest level of security. Moreover, outpatients will receive a 10% discount on medication, laboratory and X-ray fees. This special privilege can be redeemed each time you make a payment through Samitivej Plus.Application process: Fill in your first name, surname, date of birth, phone number and email address. Once registered, you can to check your health details at any time through Samitivej Plus. 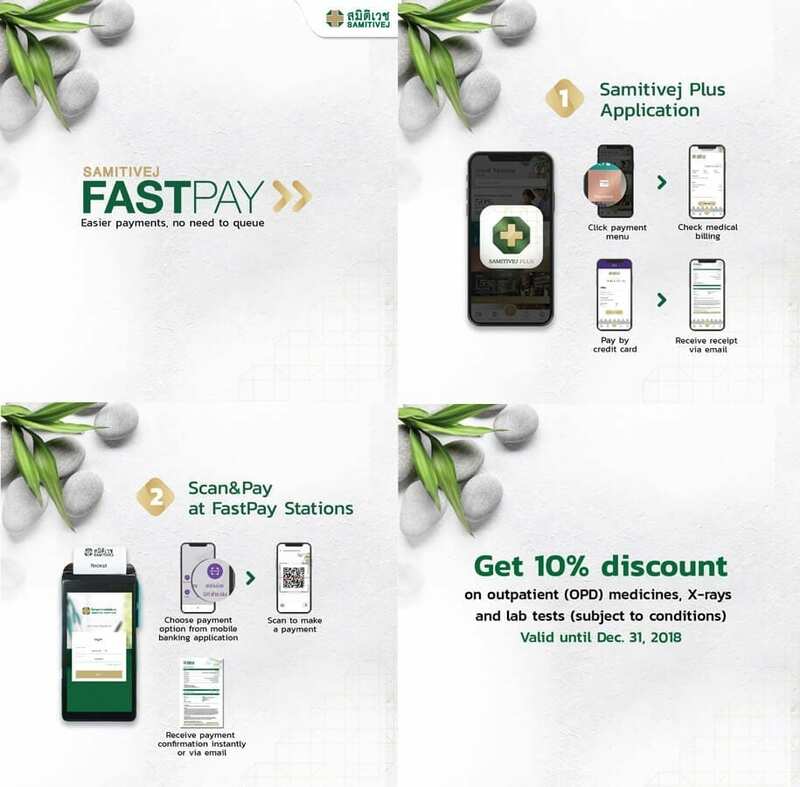 QR Code Scan at any FastPay Station: Patients can also pay by scanning their QR code, and receive a 10% discount. QR code scan is safe, convenient and supported by any bank’s mobile banking application. 10% discounts are exclusive to payments through Samitivej Plus and FastPay. 10% discounts apply to medication, laboratory and X-ray fees only and are exclusive to outpatients. Excluded are doctor’s fees, special medication fees, CT, MRI and ultrasound scan fees, and any special medical instrument fees. Discounts are valid until December 31, 2018. The discounts cannot be used in conjunction with any other Samitivej discounts, promotions or special privileges. The discounts may only be redeemed at Samitivej Sukhumvit Hospital, Samitivej Srinakarin Hospital and Samitivej Children’s Hospital. The hospital reserves the right reserves the right to change these terms and conditions at any time without prior notice. The receipts issued by these payment channels are sent via email or SMS message and may be used for requesting an official tax invoice at the accounting department.